← The Perfect Risotto? Easy! We can’t understand why every restaurant we go to always carries the same two “boring beyond belief” salads. The Chef salad and the Cesar salad. Especially when there are such amazing options out there! Here is one of our spring and summer favorites – we find it tasty and fresh all year round. Yes, we are big consumers of the “salad” and over the next few months will share as many of the creative variety as we can muster. 1 small head Bibb or Boston lettuce, torn into bite-size pieces (to yield 3 cups) – or Arugula – our personal favorite! 2-3 large heads Belgian endive or 2 small bunches watercress, sliced into bite-size pieces (to yield 3 cups) – again remove the thick center. Make the spiced nuts: Heat the oven to 350°F. Combine the sugar, cinnamon, coriander, and star anise or anise seed. Put the walnut halves on a baking sheet and toast them very lightly in the oven, just 2 to 3 minutes. Meanwhile, set a large skillet over medium heat and put the sugar mixture in it, shaking the pan to spread it evenly. When the sugar starts to melt a little, add the walnuts while they’re still warm. Shake the pan vigorously until the sugar melts completely, turns medium amber, and coats the nuts as much as possible, 2 to 7 minutes. Keep a good watch; this happens fast. You’ll need to nudge the nuts with a wooden spoon to cover them as much as possible. (This won’t be a completely smooth caramel, and the sugar will adhere to the nuts in patches.) Scrape the nuts onto a plate to cool in one layer. When completely cool, seal in an airtight container. Assemble the salad: In a large bowl, toss the greens with your hands. Just before serving, whisk the vinaigrette to blend and toss it with the greens. Taste for seasoning; the salad may need a bit more salt and pepper. Mound the greens in the center of each plate. Slice the pears (we like to leave the peel on for color and nutrients). Divide the cheese and the pear slices among the plates. Garnish with the spice-candied walnuts and serve! 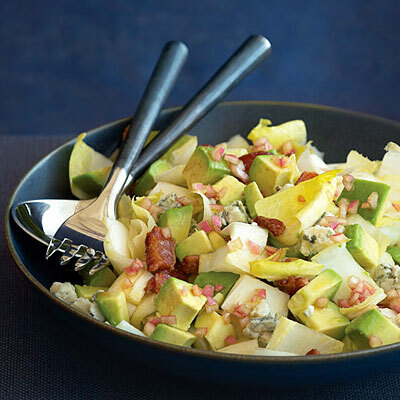 For a little twist add avocado and bacon!